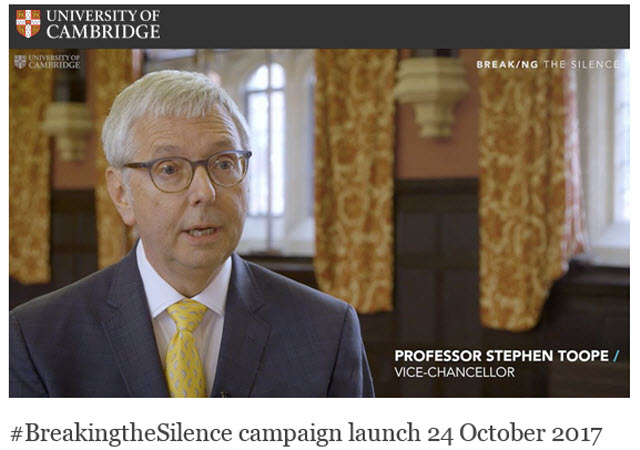 There is no place for any form of harassment or sexual misconduct at the University of Cambridge. The University is dedicated to creating and maintaining a safe, welcoming, inclusive and diverse community that nurtures a culture of mutual respect and consideration. All members of the University community must be able to thrive within their roles without fear of sexual violence, abuse, coercive behaviour or related misconduct. Any form of harassment or sexual misconduct is contrary to the values and ideals of our shared community. Such behaviour subverts the University’s mission and core values, and diminishes the integrity and dignity of all parties. The University will continuously work to improve the prevention, response, support and investigation of all instances of harassment and sexual misconduct; and to enable staff and students to make disclosures without fear of reprisal. The collegiate University's mission can be achieved only by collaboration. All members of the University community have an individual and a collective responsibility to ensure that their professional relationships are sensitive to the imbalances of power that exist within any organisation, and to promote a culture of inclusivity, underpinned by mutual respect.